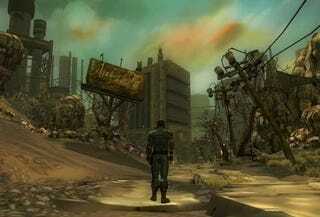 Interplay's attempt at a massively-multiplayer online Fallout comes three screen shots closer to reality, if these shots of Project V13, reported to be court submitted evidence of the game, are the real deal. Fallout fan Wikia The Vault believes them to be, writing today that they were acquired from an "anonymous, but reliable source" and that they're a part of Interplay's defense in a lawsuit filed against the developer by Fallout-rights holder Bethesda. The screens at least appear to be in line with what the Project V13 concept art hinted at, even if the purported in-game stuff looks like a very brown, very bleak place to spend one's online time. The Vault blogger Ausir also has more PV13 concept art, should you be turned off by the reality of the in-development MMO. Thanks to Dmitriy for the heads up.